When the Grateful Dead returned to the road in June of 1976, after an 18-month hiatus (which included four gigs in the Bay Area during 1975), it really was almost like encountering a new band. There were obvious changes. First and foremost was the formal reintegration of Mickey Hart into the lineup after more than five years. This was more difficult than you might imagine. After all, the period when he was out of the group was one of the most fruitful and musically adventurous of the Dead’s entire career--a time when the band, mostly sans Pigpen, who was ill for much of ’71 and ’72 and died in March ’73, were in a way forging a new identity, integrating new influences, new members (Keith and Donna), and playing with an amazing fluidity. Bringing a second drum kit into the equation necessitated a top-to-bottom rethinking of the group’s arrangements and approach. Then there was the group’s new sound system, which was a radical departure from the gargantuan Wall of Sound the band had carted around during 1974, with its columns of speakers arrayed behind the band in enormous stacks, requiring a large crew to set up and tear down, and venues big enough to accommodate the imposing mountains of gear. For their first tour in ’76, the band returned to small, acoustically clean theaters (selling tickets only by mail order, with folks on the Dead Heads mailing list offered first crack; an innovation in itself) and utilized a more conventional system--though still state-of-the-art, it had left and right side PA stacks and monitor wedges at the front of the stage. There were new instruments, too, since the final ’74 shows at Winterland: Garcia now played a white Travis Bean guitar instead of his Irwin “Wolf”; Weir switched from his Gibson 335 to a custom Ibanez model; and Phil moved full-time from the “Alembicized” Guild Starfire model he mostly played in ’74 (nicknamed “Big Brown”), to the space-age custom Alembic quad bass (“Mission Control”) he’d used only periodically since he introduced it in the fall of ’73. The sound of the ’76 Dead was also influenced by the way the band had made their 1975 album, Blues For Allah. Rather than road testing material over a period of months and then recording the base tracks for the songs essentially live in the studio (as they had for much of their Wake Of The Flood and From The Mars Hotel albums), on Blues For Allah, the songs were developed from scratch mostly in the tight confines of Bob Weir’s new recording studio adjacent to his house in Mill Valley, north of San Francisco. Sitting in close proximity day after day and working through myriad musical ideas as a group encouraged the band members to listen to each other with new ears in a way, and they developed a remarkably intimate rapport, almost like an electric chamber music ensemble. It probably helped, too, that both Garcia and Weir had been working a lot in small clubs with their own group--Bob with Kingfish and Jerry with the latest iteration of the Jerry Garcia Band, featuring Keith and Donna. It was quite a departure from the large venues the Dead had been playing during most of 1974. Garcia and Weir also worked on albums during ’75: Garcia on Reflections, featuring the Dead on half the tracks and the JGB with Nicky Hopkins (augmented with some other players) on the other half; Weir on Kingfish’s eponymous debut. It’s not too surprising then, that some songs each recorded for their own albums leaked into the Dead’s repertoire when the group reassembled for rehearsals in May 1976. From the Kingfish songbook came the dynamic connected pair of Weir-John Barlow tunes “Lazy Lightning” and “Supplication.” And two recent Garcia-Robert Hunter tunes from Reflections came to the Dead: “Mission In the Rain,” which the JGB started playing in the fall of 1975, and “Might As Well,” a sprightly rocker about the Dead’s famous trans-Canada train trip with Janis Joplin, The Band, and others back in the summer of 1970. “Comes A Time” was not new to the Dead, but it had not been recorded until Reflections, and when it was reintroduced as a live tune on June 12, 1976, it had been absent from the repertoire for nearly four years. Two songs from Garcia’s and Weir’s first solo albums, “The Wheel” and “Cassidy” respectively, also blossomed on the June 1976 tour, and like so many of the tunes that were introduced or revived for that tour, they featured Donna’s vocals prominently. A slower “St. Stephen” (missing since ’71) now featured the “Ladyfinger dipped in moonlight” bridge in waltz time, with Donna and Jerry singing together, and “Cosmic Charlie” (gone since January ’71) came back as a three-part harmony showcase that would not have been out of place in the gospel-drenched ’76 version of the JGB. And speaking of gospel, one of the most exciting “new” songs introduced by the band upon their return was a highly rhythmic, Weir-sung take on “Samson And Delilah,” originally recorded in the late ‘20s by Blind Will Johnson, but later associated more with Reverend Gary Davis (not to mention Peter Paul & Mary, whose “If I Had My Way” was on their massively popular debut album. In 1976, tape trading among Dead Heads was not exactly widespread (’77 is when it really exploded), and of course there was no Internet, so when the Dead came to town with their new songs and a different sound, it was a complete surprise to most fans. Some were disappointed by what they felt was a propensity to slow down the tempos of cherished tunes; other felt the band was jamming less and taking fewer chances musically. There is some truth to both of those complaints, but as had always been the case, it depended on the night you caught them. There were still hair-raising space jams to be found, and though there may have been more ballads in the mix, on that first tour of theaters most of them were rendered so exquisitely--the singers could really hear themselves well in those smaller venues--they were like little sparkling jewels. Frankly, the few hard-core faithful who had minor quarrels with the band were far outnumbered by the many thousands who were blissfully happy to have the Dead back in action, playing in cool places, and trying some new and different approaches to their music. Some of the early concerts on the summer ’76 tour reveal a band that is clearly still searching to find its groove--as if the engine is trying to lock into a higher, smoother gear. 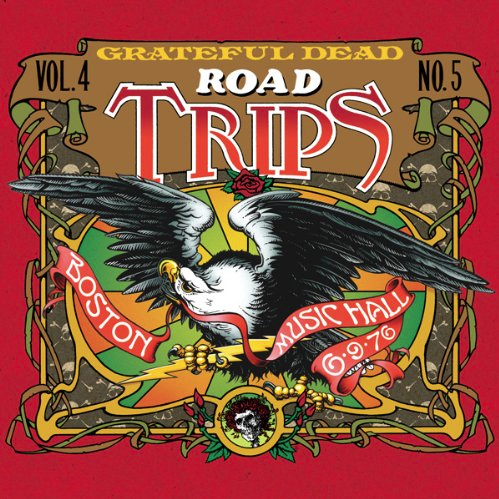 But the complete show that dominates this edition of Road Trips--from June 9, just the third concert of the tour--highlights all of the best qualities of the group’s post-hiatus period. The first half of the set is phenomenally well-executed and surprisingly jammy. Being played for the third time on the tour, “Cassidy” already sounds like a mature song, with Bob and Donna in wonderful sync on the tandem vocals, and you can almost feel the song yearning to open up (as it will as the months pass). “Scarlet Begonias” stretches out nicely after the lyric portion of the song, and two songs from Blues For Allah--”The Music Never Stopped” and “Crazy Fingers”--show how masterfully the band is able to play with dynamic shifts written into their tunes. (These versions previously appeared on the Bonus Disc of Live At The Cow Palace, New Year’s Eve 1976 released several years ago; now we hear them in their correct context.) Later in the first set, it’s a pair of back-to-back ballads that are most stunning: “Looks Like Rain” has rarely been so delicate and beautifully sung (by Bob and Donna), and “Ship of Fools” feels somehow more fresh and alive in this relatively early slot in the show. “Big River” and the set-closing “Promised Land” demonstrate, as if there was any doubt, that the band is still wearing its rock ‘n’ roll shoes. Ah, but it’s the opening of the second set that leaves a smokin’ crater in the minds of Beantown Heads. The opening notes of “St. Stephen”--missing in action for five years--is cause for serious rejoicing, and then the song becomes a leaping off point for a spectacular jam that goes places no “Stephen” had ever gone (it’s a new day, all right?) before coming back for the final verse. That then drops into a lovely nuanced “Eyes of the World,” which the band unravels methodically, almost in reverse of the way they played it in ’74--that is, laying down what had traditionally been part of a long ending jam, complete with key shifts, before the first verse even appears, a little after the eight-minute mark. The retooled “Let It Grow” follows, and this, too, shows the players’ unmistakable engagement with each other and the material as it zips along, every interlocking part in place. The same is true for the kinetic combo of “Lazy Lightning” > “Supplication”--it feels perfect for this band at this stage of their career, like the “velvet thunder” it speaks of. Again, two gorgeous ballads are standouts in the middle of set two: “High Time” and “It Must Have Been The Roses.” A bit later “Wharf Rat” packs an emotional wallop sandwiched between the disco-fide “Dancing In The Street” and the set-ending romp on “Around And Around.” Be sure to listen to the parts Phil plays on the choruses of that chuck Berry classic--what a monster he is! The encore no doubt surprised every soul in the venerable Music Hall: the bubbly, still-new “Franklin’s Tower,” evidently on loan for the evening from its brothers “Help On The Way” and “Slipknot!” This would be the only time in the Dead’s history that song was played as an encore. Nice to have you back, Grateful Dead! This album was released in November 2011.